Blizzard has an updated build of Overwatch open to the public at PAX East 2015. It’s roughly the same thing we put our hands on at BlizzCon late last year, but between then and now Blizzard has added two new playable characters, Zarya and McCree. 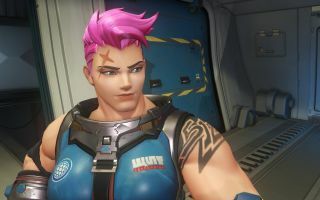 Zarya, with her Russian name and weightlifter’s physique, comes off as the long-lost sci-fi sister to Team Fortress 2’s Heavy. Her playing style is pretty different, however. She carries a particle cannon with two modes: a short-ranged, lean energy beam (left mouse button) and a energy grenade launcher on RMB. Broadly, the weapon feels like Blizzard welded the Pyro’s flamethrower (except without the damage-over-time effect) to the Demoman’s grenade launcher (except without the bouncing effect; the grenades detonate on impact). Zarya is durable. Against the first-timers at PAX East, I was able to chain 16 kills together on defense by lobbing energy grenades into bottlenecks, keeping myself alive with her particle barrier ability, a small bubble shield that I could fire through. I paired that with Zarya’s projected barrier, which I could cast on any ally. I threw it on my medic, Mercy, as often as I could to protect my source of healing. Zarya’s character info panel indicated that blocking damage buffs her own damage output, which I’m assuming applies to both of these shield abilities. Less fun, though, was Zarya’s ultimate ability. Each Overwatch character has one of these, a special move that charges as you deal damage (or heal, if you’re a medic) but retains that charge between deaths. Zarya’s graviton surge throws a gravity well into the map that pulls enemies toward it, but I couldn’t get a hang for its effect radius during the short session at PAX. McCree, no doubt a cowboy hat-tip to good-bad classic FMV game Mad Dog McCree, is much more of an offensive-minded, dueling-style character than Zarya. I found him wonderfully straightforward: his six-shot “peacekeeper” revolver does loads of damage when fired normally, and hitting RMB fanned the revolver’s hammer at close range, emptying the gun in a less-accurate burst to finish off wounded enemies. The E key throws out a flashbang, a great initiation move. The flashbang seemed like it had a pretty tiny radius—maybe five or 10 feet—and blinded enemies had an effect indicator over their head to indicate that they were ripe for shooting. McCree’s dodge roll, on the shift key has a longer cooldown than you’d expect—5 or 6 seconds—for an ability of that type, and I found myself saving it to evade enemies’ special attacks. Overwatch, as I felt when I played it at BlizzCon, is remarkably polished for a game that suddenly materialized in October. Individual character abilities and movement are intuitive on the surface: everyone essentially has a single weapon supported by three cooldown abilities, which means you can familiarize yourself with most characters in a single life. But my big concern about Overwatch remains the same: can its 14 mechanically-diverse characters (with more surely on the way) stay this varied and interesting without upsetting game balance? Overwatch isn’t a MOBA, but the spectrum of things you can do in it—teleportation, transforming into (or building) a turret, jetpacking, grapple-pulling, shields, mines, sniping—seems nearly as vast as Smite or Dota 2. Giving all of these weapons and abilities a impact and meaning within a match will be a huge challenge for Blizzard. How will Blizzard design maps that give room for and encourage all of these diverse abilities without each of its levels being too similar to one another? I admire Blizzard’s ambition to throw a ton of diverse characters into an FPS, but it remains to be seen how well they’ll be able to address the issues that come bundled with that.